Over a prolonged period of time, Mum had lost a great deal of her independence. She had become a member of Dignitas, and had decided if her terminal illness became too much to bear she would want to travel to Switzerland to end her life. There was a great deal of conversation with mum for almost a year before we went to Dignitas, to give her all the alternatives, and to try and give her other options. She was a very strong-willed person and she knew only too well what the disease would do to her. Completely of sound mind with regards to travelling to Dignitas, she was very determined to see it through to the end, and go with dignity. Some people are against assisted dying, and it will be debated for some time yet, but the question is this: is it fair and moral to prevent any person of sound mind, with a terminal disease, to choose to end their suffering at a time and place that they want to? This is a basic human right, for us all. If a loved pet for example was to have a terminal cancer we would ultimately put the animal to sleep and end its suffering. Why do we not treat the suffering of human beings with the same compassion? We both love and miss our mum terribly and both know she would have wished to die in her own home had it been possible. The law in the UK and other countries needs to be changed – my brother and I support such a change in the law to allow people of sound mind to make an informed choice to end their suffering in their own home. 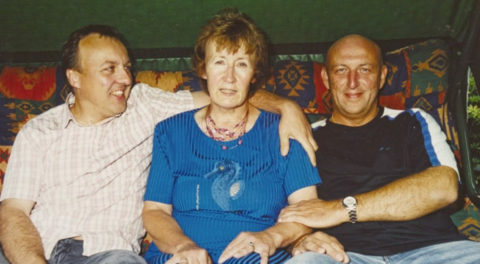 The trip to Dignitas was a sad time for everyone in our family but my brother and I went with mum to support her in her final days – we would never have let her die alone. From a personal point of view the people at Dignitas were very kind, and in March 2012, my mum said her goodbyes, lay down and went peacefully to sleep, never to suffer again. We both love and miss our mum terribly and both know she would have wished to die in her own home had it been possible, but we are happy in the fact that at all times mum retained her dignity, and ultimately she chose when and where to end her suffering.